Today, May 21st, is Armed Forces Day, the time we honor all personnel serving in the U.S. Army, U.S. Navy, U.S. Marine Corps, U.S. Air Force and U.S. Coast Guard. Thank you for your patriotic service in support of our country. First observed on May 20th, 1950, Armed Forces Day was created to honor Americans serving in the five U.S. military branches — the U.S. Army, U.S. Navy, U.S. Marine Corps, U.S. Air Force and U.S. Coast Guard — following the consolidation of the military services in the U.S. Department of Defense. In 1949, then Secretary of Defense Louis Johnson announced the creation of a single Armed Forces Day to replace separate Army, Navy, Marine Corps and Air Force Days. The single-day celebration was intended to replace the separate Army, Navy, Air Force, Marine Corps and Coast Guard Days, but the separate days are still observed, especially within the respective services. 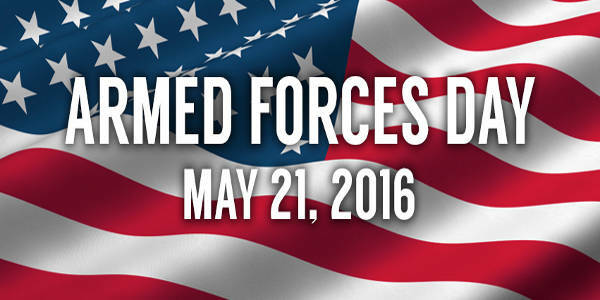 In the United States, Armed Forces Day is celebrated on the third Saturday in May. It falls near the end of Armed Forces Week, which begins on the second Saturday of May and ends on the third Sunday of May (the fourth if the month begins on a Sunday, as in 2016). Share the post "Today Is Armed Forces Day"
Barrett Firearms Mfg., famed for its big .50-cal sniper rifles, just introduced a new line of ultra-light hunting rifles. Barrett’s new Fieldcraft rifles feature carbon/Kevlar stocks and light-contour barrels. First unveiled at the NRA Annual Meeting in Louisville this weekend, Barrett’s new Fieldcraft rifles are expected to go on sale in the fall of 2016. So why is Barrett now building ultralight rifles, the “polar opposite” of a 32-pound Model 82A1? The answer is that many of Barrett’s top execs are avid hunters, and they wanted a rifle that was accurate, yet easy to carry in the field. Company President Chris Barrett explained: “Even though we are known for making the world’s finest military-grade rifles, we love to hunt. Recently we introduced the Barrett Sovereign shotgun line, and now we have created the ultimate hunting rifle.” All the new Fieldcrafts are designed to be as light as possible for each specific caliber. The goal is to allow the rifle to be carried further and longer in the field. Fieldcraft actions are scaled for each family of chamberings. The high-precision stainless steel barrels are machined to ideal contours and lengths for the specific application and caliber. Initial Fieldcraft rifles will be available in select, popular chamberings and will include left-hand models. In the future, Barrett plans to offer additional calibers and configurations. Share the post "Barrett Introduces Lightweight Fieldcraft Hunting Rifles"